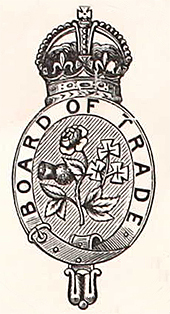 The Board of Trade, originally the Lords of Trade or Lords of Trade and Plantations is a committee of the Privy Council of the United Kingdom, first established as a temporary committee of inquiry in the 17th century that evolved gradually into a government department with a diverse range of functions. This department was merged with the Ministry of Technology in 1970 to form the Department of Trade and Industry (since 2009, the Department for Business, Innovation and Skills), headed by a Secretary of State for Trade and Industry (now Secretary of State for Business, Innovation and Skills), who is also President of the Board of Trade. The full Board has met only once since the mid-19th century, during commemorations of the bicentenary of the Board in 1986. By an order of 1845 the Board of Trade authorised a system of voluntary examinations of com­petency for men intending to become masters or mates of foreign-going British merchant ships. The system was made compulsory by the Mercantile Marine Act of 1850 and extended to masters and mates of home trade vessels by the Merchant Shipping Act of 1854. A master's or mate's certificate of competency was issued to each man who passed the examination. When being demoted from Chief to First Officer on April 9th, 1912, the heart of brave Scotsman William McMaster Murdoch must have groused for many reasons. Not only did it mean a formal regression in rank thus bearing the psychological effect of disappointment and for sure quite some resentment. More than that, it also resulted in a downgrade in salary from £25 0s 0d cutting down to £17 10s 0d. So instead of earning a round monthly wage of 25 pounds, he was cut back by nearly 8 pounds, only receiving the former wage of 17 pounds and 10 shillings. Apparently being quite a modest character inheriting his wife the respectable amount of £1.141 9s 4d, this downgrade in salary may not have been a major worry to him. As for us, we neither get the obtruding impression of a radical loss. Nevertheless, a rather painful difference in salary taking into account that William McMaster Murdoch was appointed to be Titanic`s Chief Officer only for a fortnight when joining her in Belfast most likely either on Monday, March 25th, or on Tuesday, March 26th, up until April 9th. As the White Star Line was paying their wages with painstaking precision, William Murdoch hardly had the opportunity to get used to a higher grade of compensation. A precision which turned into absurdity, when after the loss of the Titanic the Board of Trade records for deceased crew members, manifested a balance of wages due on “discharge” (a neat way to express the death of a fellow seaman) for William McMaster Murdoch to the total of £3 10s 0d. We will see later on how that amount was calculated. And yet, being on the payroll of the Oceanic Steam Navigation Company OSNC or the White Star Line certainly also had its advantages apart from the Line`sembarrassing scrutiny. The officer`s wages for instance were a fixed monthly salary on which that officer could count on, even enjoying the luxury of having 2 weeks annual holiday. A privilege which was rather an exception than the rule in the Georgian age. Unfortunately, we do not know how many years William McMaster Murdoch had been compelled to exactly the same wages hence when he was last subject to a pay rise, while inflation rate averaged by 1% a year between 1907 and 1912. The crew assignment of the White Star Line vessel Cedric dating November 1904 reveals the monthly wages of a chief mate being fixed to £17 10s and that of a 1st mate to £13 0s. In November 1907, 3 years later on, Majestic`s chief mate and a friend of William Murdoch, Edward Joseph English, still was compelled to exactly the same monthly wage of £17 10s while that of the 1st mate had increased by 1 pound to £14 0s. It is clear evidence that no major changes to the salary system within the White Star Line had occurred within the years between 1904 and 1907. However, the rate of £17 10s is exactly the monthly wage which was due to 1st officer William Murdoch in 1912 and £14 0s to 2nd mate Lightoller (see Titanic`s crew agreement). So at some point between the years 1907 and 1912, the wages of the officers apparently were adjusted by one rank each. The Imperial Merchant Service Guild is officially informed by the White Star Line of substantial improvements in the pay and general conditions of the officers of the fleet, which will take effect in the case of all steamers leaving on and after May 1. All the officers will then be granted increased pay, in many cases to the extent of £3 to £4 per month. A special system of annual leave for all the commanders and officers is to be arranged as soon as possible, and officers will be given an annual holiday extending to three weeks, two of which will be made continuous, whenever circumstances will admit of it. Officers' Royal Navy Reserve drill will not be counted as holidays. The officers will not, as hitherto, be required to undergo the sight tests at the Board of Trade, but will be examined by the company's own doctor. Considerable improvements are to be inaugurated as regards watch-keeping, and as soon as the company can arrange it, all officers throughout the company will be put on three watches, and in a large number of ships an additional officer will be carried in order that this may be done. This eventually will lead to the entire abolition of the two-watch system in the White Star Line. Improved conditions are also to be instituted in connection with the messing of the officers, who in the first-class passenger steamers will fare according to the first-class menu, the daily messing in this way to be arranged by one officer of each ship deputed by his brother officers for the purpose. In the second and third class passenger vessels and cargo steamers an improved scheme is to come into force providing for special fare in the case of commanders and officers. It is a pity that William Murdoch never was to benefit from the above improved conditions which were inaugurated one year after his death, in May 1913. Interestingly, and not necessarily common knowledge, the British currency in 1912 was based upon a non-decimal system almost solely offering coins as a means of payment. Banknotes or bills as we know and commonly use them today only became widespread from 1914 onwards, thus with the beginning of World War I, when gold and silver reserves were decreasing fast and with the Royal Bank of England issuing a Ten Shilling note. The usual way to depict prices up until decimal day in 1971 was based upon the so-called £sd system. £ reading “pound” (derived from the latin word libra), although there was no coin bearing the official denotation of a pound. The coin that had the appropriate denomination to the pound was called “Sovereign” and was a 22 carat gold coin. s reading “shilling” from the latin word solidus, and d reading “penny” (plural “pence”, not pennies) from the latin origin denarius. However, the British currency system at that time comprised more than only pence, shillings and sovereigns. The coin least in value was called “farthing” (derived from “a fourth”; depicted 1 ⁄4 d) which was a quarter of a penny. Based on that, 4 farthings made a penny. This coin was made of bronze and had a value of 1 ⁄960 pound. 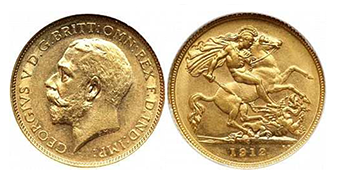 The obverse on any of the coins issued in 1912 showed a side portrait of King George V facing to the left (his full name being King George Frederick Ernest Albert of Saxe-Coburg and Gotha, born 1865), who succeeded his father (King Edward VII) in reign in May 1910. On the reverse, farthings as well as pence featured a sitting Britannia armed with a trident and shield wearing a Corinthian helmet. The latin phrase surrounding the outer rim reading “Georgius V Dei Gra:Britt:Omn:Rex Fid:Def:Ind:Imp:” is an abbreviated form for “Georgius V Dei gratia Brittannarium omnium rex, fidei defensor, India imperator”. Translated in English, it reads “George the Fifth, by the Grace of God, King of all the British territories, Defender of the Faith, Emperor of India”. 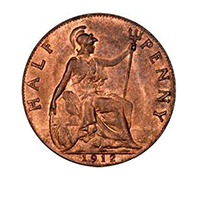 The “farthing” was followed in value by the “halfpenny” (depicted 1 ⁄2 d) , also made of bronze, of identical design and with a value of 1 ⁄480 pound. Thus, 2 halfpence made a penny. 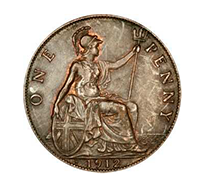 The “penny” (depicted 1d) also resembled both farthing and halfpenny in design with a value of 1 ⁄240 pound. Thus, it needed 240 pence to make a pound or match the value of a sovereign. “Threepence” and “Sixpence” (depicted 3d and 6d or -/3 and -/6) however were mainly silver coins (92,5% Ag) with reeded edges, a beeded rim and a value of 1 ⁄80 pound (=3d) or 1 ⁄40 pound (=6d). The threepence (colloquially referred to as “threepenny bit” or even “thruppence”) was quite a tiny coin measuring only 16,2 mm in diameter. Thus, it was a lot smaller than a penny or even a farthing, but given the fact that it was made of silver it was of much higher value. On the reverse of the coin, it featured a crowned denomination 3 dividing the year of issue and surrounded by a wreath. The sixpence however had a diameter of 19,41 mm featuring a lion (the King`s symbol) atop a crown also diving the year of issue. As on the obverse, the latin phrased abbreviations surrounding the rim reading “FID: DEF: IND: IMP:” are a shortened form for “fidei defensor, India imperator”. Translated it reads “Defender of the Faith, and Emperor of India”. To make a “shilling” (depicted 1s or 1/-) it needed 12 pence, 4 threepence or 2 sixpence. The shilling, identical in design to the sixpence coin, had a value of 1 ⁄20 pound and was commonly referred to as “bob”. The 2 shilling coin was called a “Florin” or colloquially “two-bob bit” (depicted 2s or 2/-). The 1912 design of the reverse was similar to Queen Victoria's Jubilee florin: Four cruciform shields, 2 of them bearing three lions passant for England, 1 lion rampant for Scotland, and 1 harp for Ireland, with 4 sceptres depicted at angles between the shields with a cross, thistle and harp on top. The value reading "two shillings" did not appear, only the inscription "One Florin". The coins of highest value were the “half sovereign” and the “sovereign”, both made of solid 22 carat gold with a value of 1 ⁄2 pound and 1 pound. On the reverse, they portrayed Saint George on a horseback killing a dragon with his sword. The “sovereign” was the equivalent to what we know as 1 pound sterling today, more commonly known as a “quid” or still called “guinea” in 1912. It looked exactly the same as the half sovereign, though both coins were differing in size: The half sovereign measured only 19.30 mm in diameter whereas the sovereign had 22.05 mm in diameter. To recapitulate, one pound or sovereign was worth 20 shillings. 1 shilling was worth 12 pence. It needed 240 pence to make a pound. 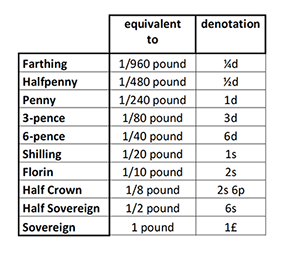 A half sovereign being the equivalent to 10 shillings or 120 pence. 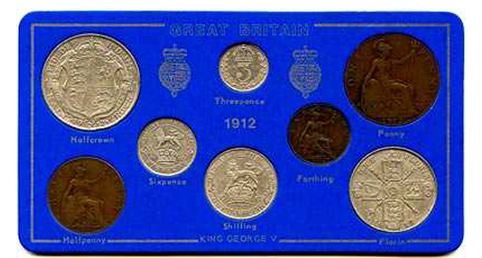 A comparison of 1912 coins (missing both sovereign gold coins). Now that we know the coins of 1912 and their denomination, let us get back to the question: Why was the White Star Line owing the balance of £3 10s 0d to William McMaster Murdoch after the Titanic disaster? Mainly, it tells us that the wages due for the time period April 1st until April 9th had already been covered respectively paid off as the crew assignment for Titanic only covers the time period from April 10th up until April 15th including. Being assigned to the Titanic as First Officer during these last days, William Murdoch was entitled to a monthly wage of £17 10s 0d as we can see from the BOT crew assignment. Converting these figures into pence, we get the total of (17x240) + (10x12) = 4.200 pence per month. Dividing that by 30 calendar days, William Murdoch ended up with a daily wage of 140 pence. Simply multiply 140 pence by 6 days (April 10th till April 15th) results in 840 pence which is the equivalent to £3 10s 0d. Almost for sure, for the first 9 days of April on which William Murdoch was assigned to the Titanic as Chief Officer, he received the amount of £7 10s 0d doing the same math as before: Take the monthly wage of a chief officer of £25 0s 0d and convert it into pence. 25x240 = 6.000 pence. Divide it by 30 calendar days resulting in 200 pence per day. Multiply by 9 days results in 1.800 pence which equals £7 10s 0d. We may wonder what exactly the value or the purchasing power of these coins/wages was compared to our modern currency that we are used to today. Only if it is for the benefit of being able to estimate the real loss of Titanic`s First Officer William McMaster Murdoch in being downgraded from £25 0s 0d to £17 10s 0d wages instead. Thus, William McMaster Murdoch earned a monthly wage of approx. GBP 1.490 as a First Officer instead of GBP 2.125 as a Chief, a difference or loss to him of no less than GBP 635 (!) per month in modern terms of currency. His daily wage of 140 pence equals GBP 49 these days, or just a little more than £6 per hour officially being on watch for 8 hours a day. Compared to 2015, a Royal Navy Lieutenant depending on level (1-9) is granted the annual income between GBP 39.236 up until GBP 46.660, thus receiving a monthly wage of either GBP 3.270 up until GBP 3.888. William Murdoch however, being a 1st mate which equaled the rank of a Royal Navy Lieutenant, only earned GBP 17.880 per annum. Adding to that income received from the White Star Line, The Royal Naval Reserve granted him an annual allowance of £25 (thus no more than a monthly chief mate`s wages!) for bearing the rank of a Lieutenant. Overall, from 1910 onwards after being promoted by the RNR in September 1909, Will Murdoch more or less ended up with an annual income of £235 or approx. GBP 20.000. Apparently, his way of life was such a modest one, that he was able to inherit his wife the most incredible amount of nearly GBP 97.025 (ref. National probate calendar dating June 1912). It remains however unclear, whether Ada was able to fully benefit from his inheritance. To evaluate Murdoch`s income, we also need to understand what it meant to spend life in 1912. A daily newspaper for instance at that time usually cost 1 penny (1d). 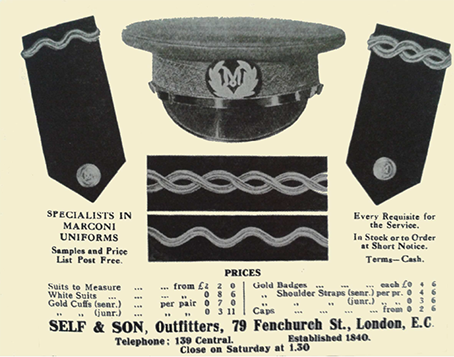 Looking at an advertisement of Naval Outfitters Harvey`s in 17 London Street, or Self & Son in 79 Fenchurch Street (dating 1914), a pair of senior gold cuffs cost 7/- or 7 shillings which equals GBP 30,50 today. It would underline Titanic`s senior officers unwillingness to have their rank insignia changed back after the reshuffle bearing in mind that they were told the downgrade would only be for this one specific voyage. A complete uniform in fine quality for instance, with lace and buttons, summed up to 84s (Harvey`s in 1918), which meant £4 4s thus today it would cost GBP 365 (shoes not included). A bridge coat with shoulder straps and buttons, complete 70s, £3 10s (=GBP 305). Additionally to having two different winter outfits (emblazoned dress and normal undress versions) as well as summer white uniforms with different shoes each for his service on White Star Line vessels, the Royal Naval Reserve demanded a N°.5 dress “Undress” as well as a N°. 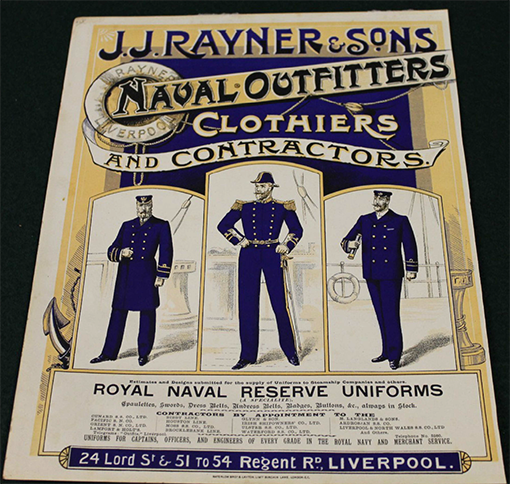 7 dress “Mess undress” outfit from him with a ceremonial sword, undress belt and respective rank insignia with no compensation at all (see J.J. Rayner & Sons advertisement for RNR uniforms). A little bottle of perfume from Vinolia for instance cost 2/- or 3/6. A bottle of Scotch Whisky from John Begg`s 4/-. A tin of Crawford`s short bread “Royal Stuart” 1/5. A flask of Odol mouthwash 1/6. To rent a flat with 4 rooms depending on size and equipment (bathroom/ kitchen or not) ranked between £28 and £35 p.a. (=per annum), thus averaged about £3 per month (=GBP255). Upper class flats even cost up to £52 to £56 per annum, thus averaged £4 10s 0d per month (=GBP 384). 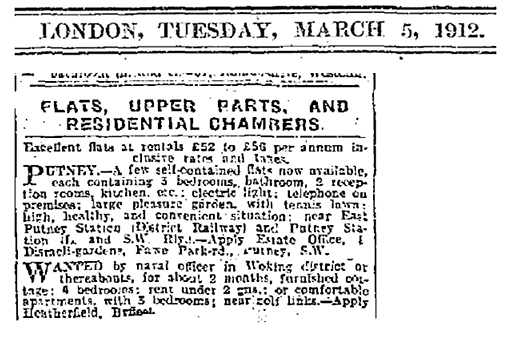 Ad from the London Daily Mail dating March, 1912. A naval officer seeking for a furnished cottage under 2 gns (=guineas). Earning over £160 p.a., William McMaster Murdoch was even liable to pay income tax on his salary which was approx. 1s in the pound of chargeable income. Leave alone costs for electricity/gas or coal/water supplies, insurances, membership fees (Murdoch was a member of the Imperial Merchant Service Guild), clothing and daily food provision. Despite of that, with an annual income of over £200, William Murdoch clearly belonged to the middle class of 1912 society.